Anathema is a Weapon in Divinity Orginal Sin 2. It is the most powerful weapon in the game. To maximize the power of this weapon, use Rage + All In. Do not use Onslaught, as Anathema will break on the first hit. I felt like offing the dude for making such a brittle sword. What a waste of time, now I&apos;m going to pick his pocket clean. Very.... anticlimactic weapon for all the buildup it gets. It&apos;s a bloody shame that it&apos;s good for nothing due to brittle and unrepairable perks, and given you get it so late in game - it&apos;s barely worth the trouble. This game SORELY lacks unique weapons with fixed stats and lore attached to them, only 2 coming to mind being Swornbreaker and Anathema, and both being unrepairable. At least swornbreaker is not brittle. Good thing I found out it can only be used once or else I might have gotten excited...well 35k gold is 35k gold I guess. Horrible. Dealt around 1k damage to Rex&apos;s armor. USELESS. ALL that time questing for it. 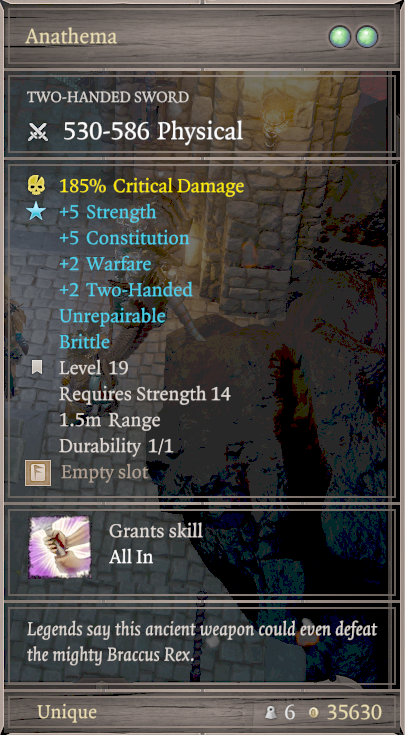 Imho only useful when you go for a lone wolf build, else you barely have enough AP to use it properly. I dealt 18500 dmg with one blow, not enough to kill Braccus Rey tho. In a good game, they would just let you use the friggin&apos; sword. This does NOT work with Onslaught (as of 2/21/18). It breaks on the first strike. what a blue balling moment when you realize this***** can only be swung once. actually useless they build it up like its some amazing weapon and then during the final battle i waste an ability on it and it breaks. It seems you need to have str physical build to put this weapon to a good use, yes? perhaps this is broken in some way? I tried using onslaught and it broke instantly, doing very little damage.